Nice and clean apartment on a nice location. Silent by night and during daytime. The best location in Barcelona, quiet and friendly area. The apartment was very clean and fully equipped. Situated in the picturesque Eixample neighborhood, this modern and stylish one-bedroom apartment in Barcelona is located close to some of Barcelona´s most revered sights, including Gaudí´s Sagrada Familia. With many fantastic bars, cafés and restaurants lining the surrounding streets, this locale is a great choice for anyone looking to experience everything that this amazing city has to offer! The apartment is the perfect for couples or families making their way to the Catalan capital, and can accommodate up to four people. The apartment enjoys a simplistic yet trendy feel, while the carefully selected furniture adds to the ambience of this charming space. The living room is furnished with a comfortable double sofa bed, as well as a single sofa bed and a TV, perfect for relaxing after a day of sightseeing. An Internet connection is also available, making it easy to stay in touch with friends and family back home. The colorful design of the fully equipped kitchen, where guests can prepare their favorite home-cooked meals, further adds to the charm of this lovely residence. The bedroom is furnished with a single bed.The apartment has one bathroom, fitted with a walk-in shower. 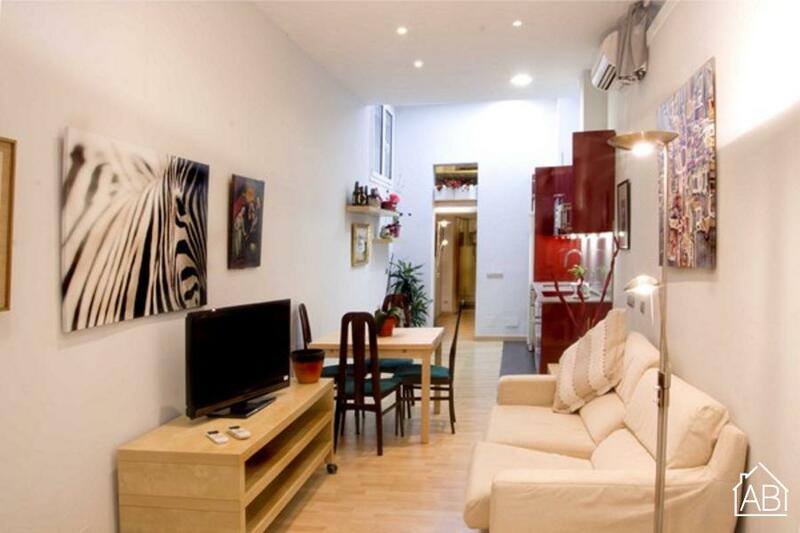 Located in one of Barcelona´s most beautiful neighborhoods, and with easy access to all of the city´s sights, this lovely apartment, complete with central heating, heaters and air-conditioning, is the perfect choice for your trip to the Catalan capital, any time of the year!